This edition of the Kaslo Hotel, while having the heritage character of Kaslo Villa ge, is completely new. Overlooking Kootenay Lake, the Kaslo Hotel opened in February 2009 after extensive renovations that began in 2006. The new Kaslo Hotel was designed to provide the latest of luxury hotel accommodations without giving up that personal feel. The new Kaslo Hotel meets all modern building codes and goes far beyond the minimum to achieve the goal of energy efficiency. The Kaslo Hotel – your choice for hotel accommodation in Kaslo BC! For the most efficient heating and cooling system, ground source/geothermal heat pumps have been used. The system recycles heat and cold air within the hotel and provides all the hot water for use in the restaurant and hotel. For more energy efficiency, LED and compact florescent lighting have been installed, as well as special energy saving doors and windows. The latest soundproofing and fireproofing technologies have been used between rooms and also between floor levels. 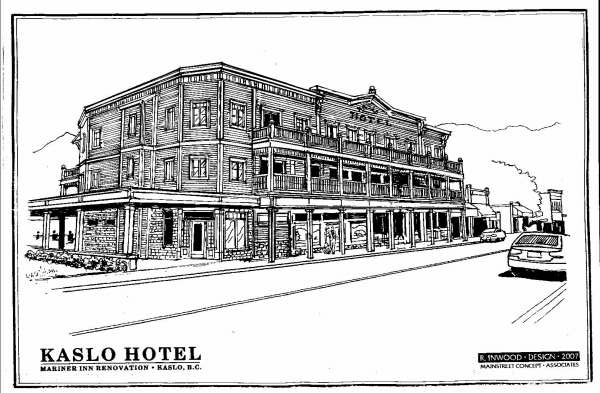 Built in 1896, the original Kaslo Hotel was considered very grand for its time. Kaslo was a bustling community of 5,000 residents with gold, silver, and lead mining. The community had a brewery and several saloons. Over the years, the busy mining and logging industries declined, as did the population of Kaslo. The hotel fell into disrepair and closed in the 1920’s, and then was acquired by the village for non-payment of taxes. It was utilized from 1942 to 1945 as accommodation for Japanese-Canadian internees being relocated from western British Columbia. At one point, about 200 individuals, including many children, were housed in the deteriorated structure. The hotel burned and was razed in 1950. A new Kaslo Hotel was constructed and opened in 1958 on the original site overlooking Kootenay Lake. It operated continuously, changing its name to the Mariner Hotel in 1981. The hotel was closed for extensive renovation in 2006, and opened again to guests in early 2009 as the Kaslo Hotel.